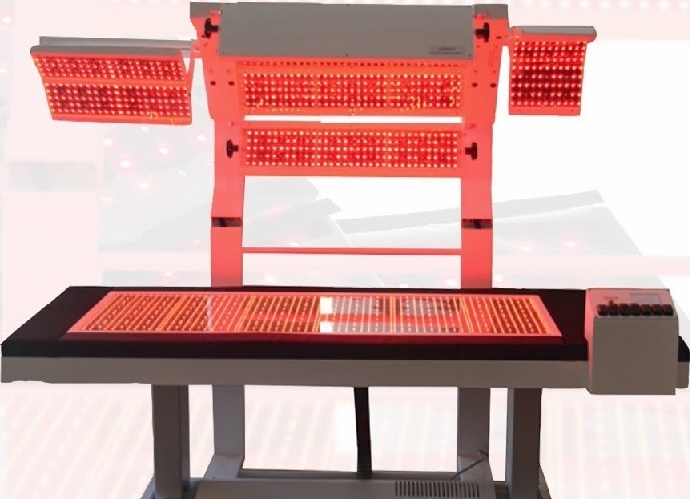 Red Light and Infrared Waves are completely safe have zero negative side effects and have been used since 1994. These are General Wellness Products and have a low risk to users safety. No Physician or license is required to offer the service to others. Slim Sculpt Pro 7 covers more body area than any other system and has 4320 powerful diodes with output at 190 mw cm2. 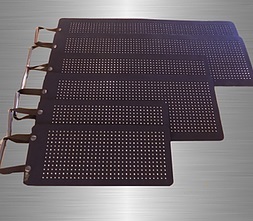 These pads are the strongest body pads currently available for the medical and aesthetic market. Lipo Melt has the latest German Microchip Technology and with 4924 diodes and a Face Mask with an output power of 100 mw cm2. Contour light has a special reflective coating on the Diodes to enhance results and has just a 1/2 inch spacing between all the diodes in both directions. The plastic sleeves that go over the pads can be removed. The design for the arm wraps are smaller but fit well and the they have a full face mask included. LED Energy safely penetrates the skin at target adipose (fat) cells and the fat absorbs the light natural. The fat becomes poreous and the Fat Cells release free fatty acids (FFA’s), water and glycerol. These compounds together are also known as triglycerides. Some of the Free Fatty Acids are converted triglycerides in the liver and returned to the plasma to be used as fuel. Trigycerides are normally released from fat cells when the body needs energy. Fatty acids and oxygen produce energy. I also use recreational oxygen and do cardio for 15 minutes right after the wrap because higher Oxygen levels in the body can enhance fat burning. I then sweat in an infrared sauna to help burn calories and release the fat cells and Toxins. Most of our toxins are stored in our fat cells so when we eliminate the toxins and excess fat we can feel better. It is critical to sweat, move the lymph and drink a lot of water right after your session to flush the fat out of the body permanantly. The fat (FFA's) must come out through your stool, urine or sweat glands or be burned off. The fat can be used as fuel or eliminated by the body and no harm is done to the fat cells; they simply shrink to a fraction of their original size. It takes weeks for the body to process the fatty acids in the blood stream so final results are not seen immediately. If you do sessions every 2 to 3 days and stay in ketosis with following the diet and exercise protocol the inch and fat loss will optimized. At least 30 minutes of walking daily is recommended. Unlike conventional liposuction, the idea of noninvasive laser lipo is not to remove fat cells, but to shrink them. 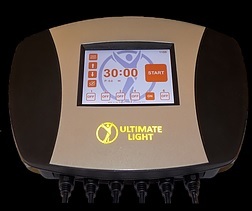 The LED laser energy penetrates down to the fat cells and creates tiny holes in their membranes. This causes the fat cells to release their stored fatty acids, glycerol, and water into the body and then shrink, potentially resulting in lost inches. The body then flushes out the expelled fat-cell contents via the lymphatic system or burns them for energy. "Think of your fat cells as groups of juicy grapes the lipo laser LED’s shrink the cell contents, and those grapes become raisins." WHO'S A GOOD CANDIDATE FOR LASER LIPO? Still not sure? Make sure to schedule a Free Consultation and Free Zyto Scan by becoming a Member. WHAT IS THE LASER LIPO PROCESS LIKE? Lipo Laser is very relaxing. 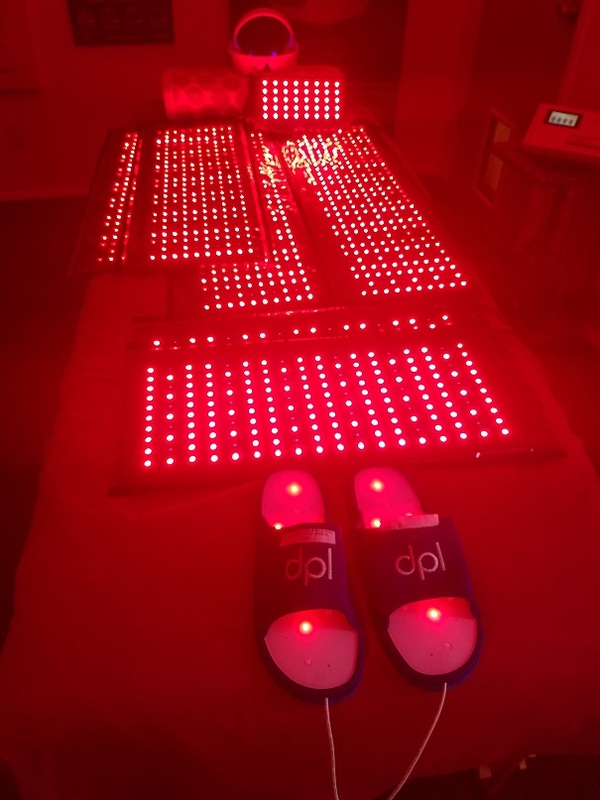 We're going wrap your entire body in Red and NIR Infrared Light put a Headset on for Light on your eyes and ears for Guided Meditation. From there, the technician applies the pads to the targeted area, inundating it with laser energy for about 10 to 20 minutes. You may see some immediate results, however it takes a couple of weeks for the body to excrete the fat through the Urine, Stool and Sweat and some of the fatty acids will get used as fuel. It is highly recommended to walk 30 minutes daily during your Lipo series. Using the WBV right after the wrap followed by an Infrared Sauna and or Ion Cleanse Footbath can help speed up results. Though some clients will begin to notice results after only a few sessions, most require 6–8 sessions to see maximum results but if you need to lose more than 20 pounds it is likely you will want to do at least 12 sessions. Two treatments per week or every other day for four to six weeks is recommended. 60 minutes we recommend a Zyto Nutritional Scan and EWOT – Exercise with Oxygen/Cardio Session so you can enjoy a 50 L bag of 96% oxygen while increasing your heart rate. Choose from walking on the Bow Flex Treadstepper, Jumping on a Jumpsport Rebounder or pedaling on a Recumbent Bike for about 15 minutes. Oxygen can help burn more fat and is used during increased heart rate. 90 minutes Add a 30 Minute Infrared Sauna Session to Sweat and Burn Calories or a relaxing 20-30 minute Detox Footbath. Avoid eating 2 hours before and after a wrap session. Drink ½ of your body weight in ounces per day and walk 30 minutes per day during your session. No Sugar, Alcohol, Grains, Rice, Potatoes or Processed Foods should be consumed for ideal results. Getting into Ketosis or using intermittent fasting or using Purium’s 10 Day Transformation Plan with Amino Acids has shown extremely positive results for most people. Please consult with your physician before starting any diet plan. 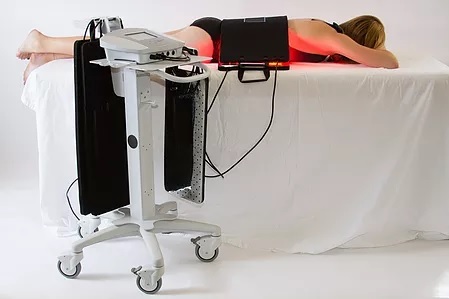 The cost of laser lipo can vary considerably depending on the size of the area you want to treat, as well as your location and the experience of the clinic you visit. A typical series of eight sessions can easily cost upward of $1,000. We offer a first time or follow up session for just $50. A 30 Minute Session is $100, 60 Minute $150 or 90 Minute $200 or get a package deal for multiple sessions. Because lipo laser does not destroy fat cells but rather empties them of their contents, the fat cells are capable of storing fat again. A balanced diet and exercise is the only way to ensure lasting results. Cryo is another new method that can help to stimulate and raise the body’s metabolism, improve blood circulation and improve muscle tone and burn calories. Cryo is an excellent way to release endorphins that are normally triggered by exercise to help boost mood and concentration. You can go into a Cryo Chamber for 3 minutes for a whole body treatment. Several Cryo Sessions a week for a couple of months can really help to restimulate the metabolism and boost mood to stay on track. Cryo 21 facilitates a thermal shock by reducing the temperature of fat cells, causing them to die-off in a natural way. This natural die-off process is called apoptosis which results in a gradual degeneration of fat cells and their evacuation of dead fat cells. (Cryo (cold) Lipolysis (breaking down of fat) of fat cells. These studies show that when cold is administered to white fat, it will promote growth of new blood vessels turning white fat to brown fat. It is much easier for the body to metabolize brown fat. 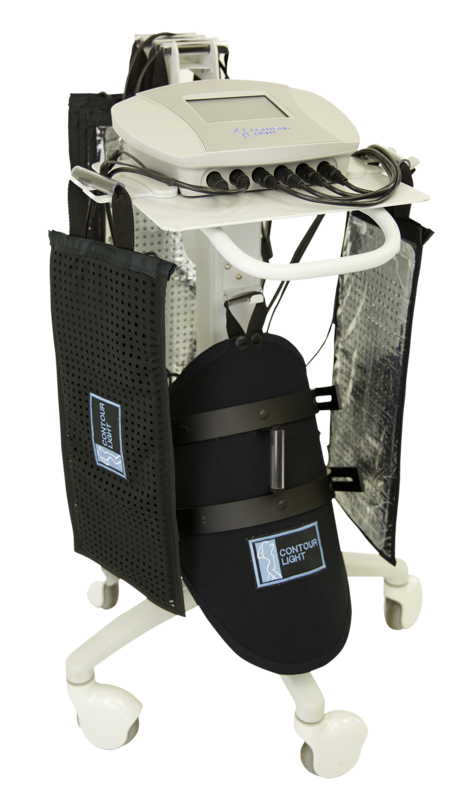 Cryo Is used for the final fat loss after using the Slim Sculpt or for problem areas. Apoptosis of fat cells occur when the machine reduces the temperature in the area from 34 °C to only 8 °C and without the client feeling cold. After 4-6 treatments it is not unusual for the clients to lose up to 12 cm around the waist or 5 sizes and this is accomplished permanently without any kind of surgery. Use very 2 weeks over a period of 3 months.